Noir meets diverse voices and transforms the genre into an over-the-top, transcendental psychedelic thriller ride in this collection of fifteen pulpy stories of conspiracy noir, riffing on the numerous fictions spun about the 44th president of the U.S.
...a collection of 15 stories so sly, fresh and Bizarro World witty, they reaffirm the resiliency of the artistic imagination ... 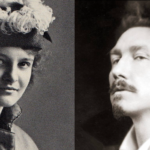 The overarching aim of all this outlandishness is to entertain, as well as to tuck some social criticism into the formulaic folds of these tales of spooks, spies, private eyes, clones, bots and alien invaders ... In recent years, writers of color have taken up sci-fi and fantasy in particular as richly poetic vehicles to explore racism and imagine alternative worlds. The pulp stories in The Obama Inheritance — sci-fi, fantasy and noir — are fun to read, and be forewarned: Many of them also pack a punch. 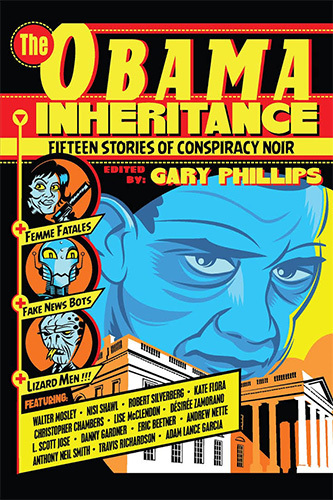 Amid this bull market for Obama-related conspiracy theories, it is entirely understandable that a group of writers felt inspired to produce, The Obama Inheritance: Fifteen Stories of Conspiracy Noir...Truth may be stranger than fiction, but why should the conspiracists have all the fun of creating fake narratives? ... Yet, running beneath the book’s mockery of conspiracy fanatics, the unspoken question that I raised earlier persists: Why are there so many outlandish conspiracy theories about the Obamas? The answer, I believe, can best be detected as this book’s authors do, through the lens of identity — and I’m not talking only about race. This collection of 15 short stories, inspired by right-wing conspiracy theories about the 44th president, take aim at the freak-show realities of the 45th … This science fiction literary act of resistance aims to be a ‘thrill ride of weirdo, noirish, pulpy goodness.’ You’ve got talking dogs, Obama as a space alien and a floating biomedical freak named Balthazar … The subtext of horror today is not the Red Menace or the atomic age, but racism, Islamophobia and ham-fisted greed. Some stories in The Obama Inheritance feel like they are one degree from reality; others are a good pole-vault from it … These tales finish as an entertaining, if uneven, look at the world we live in. What did you think of The Obama Inheritance: Fifteen Stories of Conspiracy Noir?